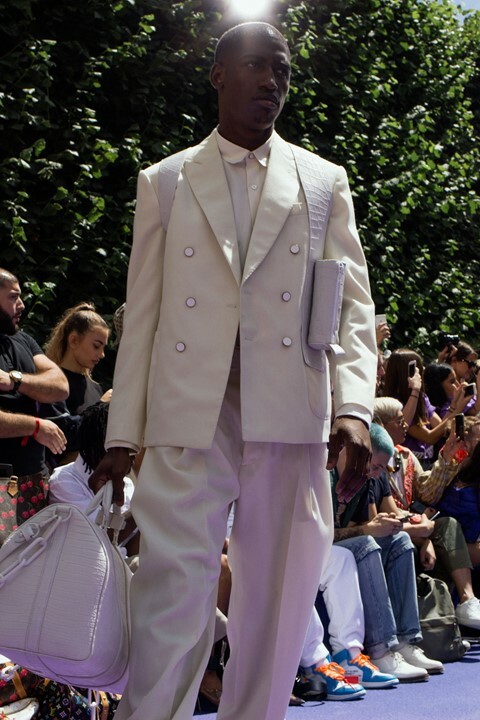 After months of anticipation, yesterday Virgil Abloh finally presented his debut Louis Vuitton menswear collection. With the likes of Kanye West, Kim K, Kylie Jenner, Takashi Murakami, Naomi Campbell, Rihanna, the fashion press, and about a thousand students all attending, it’s safe to say all eyes were on the designer. Hailing from London and part of Skepta’s crew, Lash counts Grace Ladoja and Naomi Campbell (“she’s the queen of the industry,” he says) among his fans. Obviously Abloh is too, given he drafted him to open the show just a day before it took place. “I walked into the fitting with and he said ‘oh yeah, your photo is first’”, he explains. For some, something this big might trigger an attack of nerves. But not Lash: he was “ready to execute”.